Nigeria’s Simidele Adeagbo had a personal best push start of 5.02 seconds and downtime of 53.79 seconds at the International Bobsleigh & Skeleton Federation (IBSF) Skeleton Intercontinental Cup in Utah, USA. Simidele also recorded the joint fastest push start with Chengfeng Long of China to finish the day in the 21st position. She added that she was very excited when some tourists visiting, became surprised to see a Nigerian athlete competing. “I think the most exciting part of today was a story somebody told me; some tourists came over and were surprised to see a Nigerian athlete out here. She added: “But Nigeria doesn’t have snow, they said and this is exactly what this journey is all about; breaking barriers, pushing boundaries and changing the narrative and I am so excited I can go on this journey. 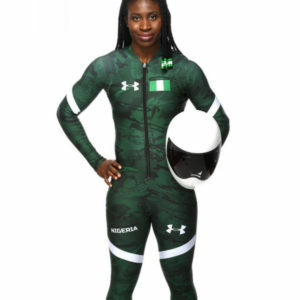 At the 2018 PyeongChang Winter Games, Simidele became the first African female to compete in the skeleton event and also became the first Nigerian to compete at the Winter Olympics. She also became the first Nigerian to compete at the International Bobsleigh & Skeleton Federation (IBSF) Skeleton International Cup yesterday.